On Monday, January 18 (10 am), the court will reconvene in Vancouver to hear the Nuu-chah-nulth case. We are counting on a strong presence of Nuu-chah-nulth Ha’wiih, Chiefs, and supporters to attend the trial on that day and for as much of the upcoming phase of the trial as possible. The trial is expected to go from January 18 to mid-April with a week-long trial break from February 8-12, and also for the weeks of March 7-11 and March 28- 31. The trial is scheduled to be held in Ahousaht the week of April 4-8. We look forward to seeing Nuu-chah-nulth Ha’wiih, Chiefs and other supporters on January 18 at the Vancouver Law Courts (800 Smithe Street) at Howe and Nelson Streets in Vancouver, courtroom 44. 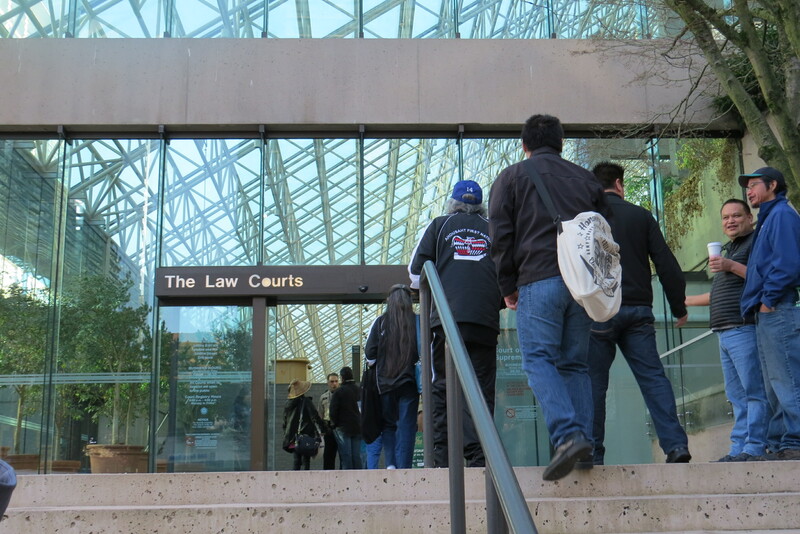 Nuu-chah-nulth enter the Vancouver Law Courts yet again to have their rights recognized.